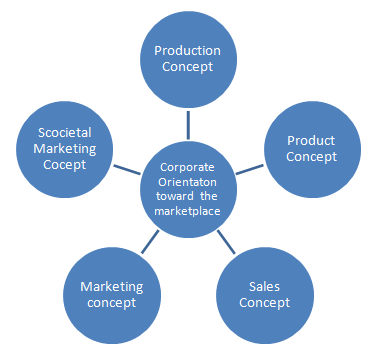 Company orientation toward the marketplace can be defined as the orientation or philosophy of the organization to success. There are different concepts from which we can understand an organization’s orientation toward its market. Production Concept – The production concept emphasis on production and assumes that the customer always respond to products that are made available to them. In this the organization makes effort to increase production. Product Concept – The product concept put emphasis to increase quality of product. The product concept assumes that the customer always respond favorably to the better quality product that are reasonably priced. Hence, the effort is made to increase the quality of the product. Sales Concept – The selling concept assumes that the customer will generally not buy enough of the firm’s product unless their interest is increased or stimulated in its product through significant selling and promotion activities. In the sales concept the emphasis was on the selling and promotion activities. Marketing Concept – It is the business orientation or philosophy that holds that organizational success is dependent upon the efficient identification of the needs and wants of target markets and the effective satisfaction of them. Societal Marketing Concept – The social marketing concept is a business orientation that holds that the key task of serving the target markets in such a way that provide maximum customer satisfaction and log run individual social benefit. This concept put emphasis on the social responsibilities of business as the latest trend in marketing.